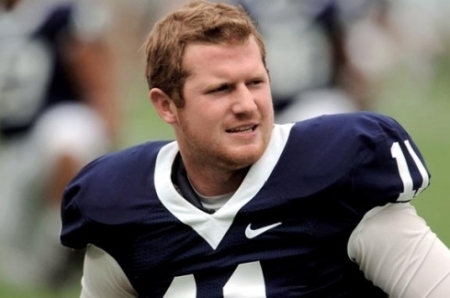 Now, Matt McGloin, quarterback for the Penn State Nittany Lions, has been selected as a finalist for the Burlsworth Trophy. The award is given to the most outstanding college football player who began his career as a walk-on. It’s named after Brandon Burlsworth who was a walk-on at the University of Arkansas. Burlsworth was selected by the Indianapolis Colts in the 1999 NFL Draft, but was killed eleven days later in a car crash. The two other finalists are Jordan Kovacs of Michigan and David Quessenberry of San Jose State. You can vote online here: http://burlsworthtrophy.com/?page_id=951. The winner will be announced at a ceremony on December 3rd. McGloin threw for 3271 yards, 24 touchdowns, and only five interceptions in 2012.